Aqua Mizer — N&N Supply Company, Inc.
Aqua Mizer, Inc, has introduced a revolutionary new toilet tank flush system that will save tens of thousands of gallons of water per toilet per year by stopping leaks and saving water with each flush. There is nothing else like it on the market. product is easily installed and does not require tank removal. It will never require maintenance due to a broken diaphragm. 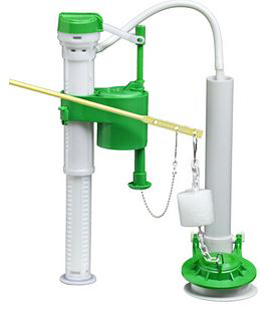 Unlike conventional fill valves, once the intake valve is closed, it will not allow additional water into the tank unless the flush lever is activated. This prevents additional water from flowing into the tank, even if there is a leak in the flapper. allow additional water into the tank unless the flush lever is activated. This prevents additional water from flowing into the tank, even if there is a leak in the flapper.